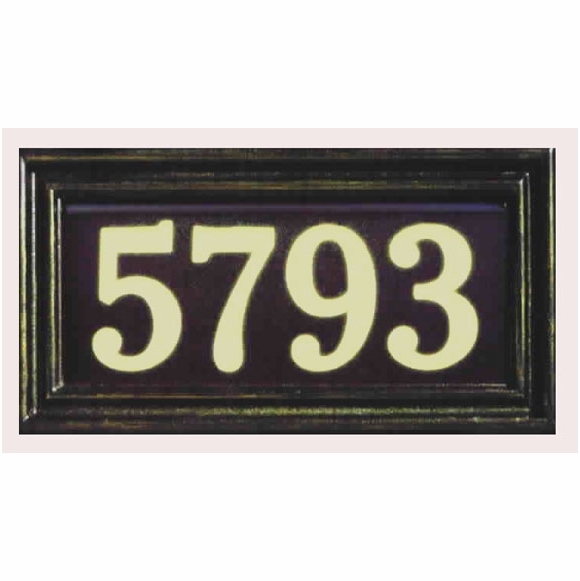 Whitehall 5695 Illuminator Address Marker - - illuminates your address for better nighttime visibility. Internal light sensor automatically turns plaque on at dusk and off at dawn. 8 D-batteries (not included) provide 5 months of continuous nighttime illumination. White vinyl numbers provide excellent visibility day and night. Includes optional lawn stake. Dimensions: 13.38" x 7". Colors: verdigris, pewter silver, french bronze (shown in large image), black. Holds up to 5 characters (characters are 3.25" high). Please type the text you desire in the boxes provided. Illuminated address plaques are crafted from rust-free recycled aluminum. Paints have been specially formulated and weather tested to withstand the harshest elements. Made for you in the USA. Please allow 2 to 3 weeks for delivery.